I live a short 5 minute walk from McMenamins Edgefield, a 74 acre resort that includes extensive gardens, a hotel, golf course, many restaurants and pubs, a movie theater, spa and a lot more. It is a great place to hang out with friends or even just to walk through. It has been especially foggy the past few days, and Wednesday night was no different. While I longed to go somewhere in the city and capture the lights, it was not in the cards this night, so I went next door to old Edgefield and focused my lens on the sights there. It was eerily still and I was pretty much alone as I wandered the grounds. This photo of the old water tower than stands in the middle of the property was my favorite capture of the night. 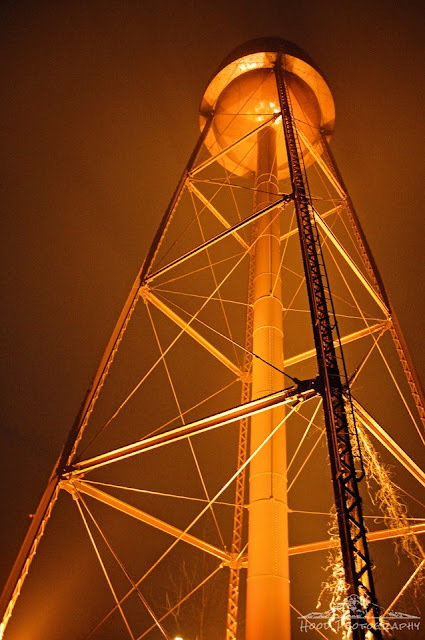 I love the orange glow of the tower against the foggy night. an outstanding photo with the misty orange light Sarah. Wow!!! Well done!!!! I really like this photo! You have turned this old water tower into a work of art. Marvelous photo! How artistic, I love it! That is a magnificent water tower. I love that place! Nice shot of the watertower. It looks lovely from this angle! I Have to Stop at Crown Point!